Cincinnati, OH - For over one thousand years, Orthodox Christians have observed the Sunday of Orthodoxy. The first Sunday of Great Lent is commonly known among Orthodox Christians as The SUNDAY OF ORTHODOXY. This important day has been established by Orthodox Christians to honor the memory of the multitude of martyrs, saints, clergymen, men and women; both princes and princesses and commoners alike, who sacrificed their lives for what Orthodox faithful refer to as “The Church of our Fathers”. This very important day is especially important because of the commemoration of the Restoration of the Holy Icons, which previous to 843 AD icons had been removed from churches by government edict. Byzantine emperors, having been influenced by heretical concepts, did not allot the public use and veneration of icons. The Orthodox Church teaches us that icons are the windows of Heaven from where Saints look down upon us to protect us and to intercede with Christ for our salvation. This day is especially important for Orthodox Christians, to commemorate this event, recognize the importance of icons, and to reflect on the upcoming spiritual journey of Lent. 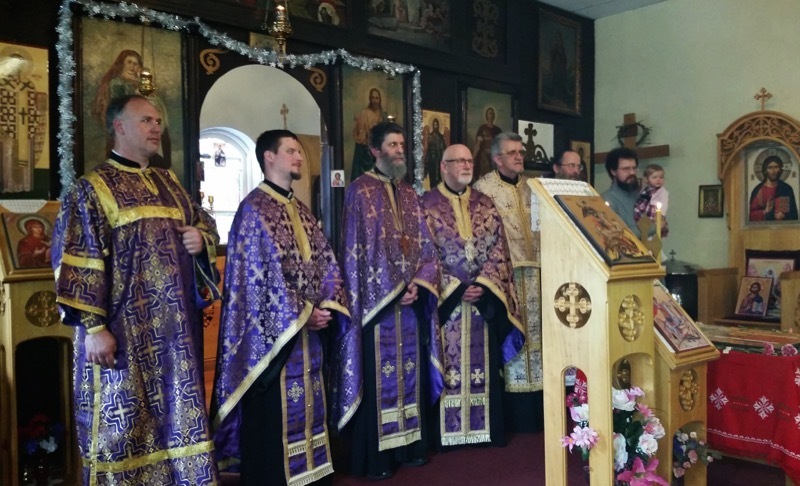 On Sunday March 20, 2016, the St. George Serbian Orthodox Church in Cincinnati Ohio was packed with faithful parishioners from various Orthodox churches throughout the Cincinnati and Northern Kentucky area. Very Reverend Petar Petrovic was the host priest at St George, and he eagerly welcomed concelebrants Fr. Steven Kostoff, (parish priest of Christ the Saviour-Holy Spirit Orthodox Church (OCA), Fr. Bill Cassis (parish priest of Holy Trinity-St Nicholas Greek Orthodox Church), Fr. William Redmon (St Nicholas Greek Orthodox Church), Fr. Daniel Marhsall (St. George Russian Orthodox Church), Fr. Paul Akmolin, (St George Russian Orthodox Church, and Deacon Aleksander Petrovsky (St George Russian Orthodox Church). The St. George Russian Orthodox Church Choir was present to sing during the Vespers, under the direction of Choir Director Dr. Kurt Sander. The choir was fantastic and Fr. Petrovic specifically mentioned at the conclusion of Vespers that the choir filled the church with such a great sense of prayer and that he felt he was in heaven. Fr. Steven Kostoff, also a professor of theology at Xavier University gave a nice sermon on the importance of Lent, and the necessity for Orthodox Christians to unite in this time of worldly uncertainty. Aleksander Jovic, parishioner at St. George Serbian Church who works professionally in the film and media industry was on hand to capture this monumental event with photographs and video. Service books were prepared and provided by Fr. Petar Petrovic. After Vesper service, Protonica Gordana Petrovic, along with the KSS sisters from St. George Serbian parish prepared a delicious Lenten dinner for all people who attended. The church hall was completely packed as the evening came to a conclusion. The dinner was much appreciated and well received. This was a very important evening, and Fr. Kostoff specifically thanks Fr. Petar and the St George congregation for hosting this evening.